You play Senua, with the game opening up to you floating down a river on a log while the narration of the game gives you a bit of story. While the game sees you on a long quest (about eight to ten hours long for me) trying to get back a soul of a loved one, the main attraction is the game handling a subject I don't think many games have in the past, and also the reason it has won a bunch of awards, including some this week from Bafta. As the small documentary found on the menu of the game states. mental health and most prominently psychosis are a taboo subject, but the game does a great job in many areas to help bring it to a gamer through both what takes place on the screen and even more so on what goes on through your ears. The audio for this is perhaps some of the best I've heard in a videogame, with Ninja Theory making the voices in your head a key aspect of your time spent with the game. Not ever suffering from any of the things covered in this, the sound was something that was very uncomfortable for me, with me having to take breaks every now and then by pausing every few hours and just having a quick couple of minutes away. Not because it was bothering me or causing any actual issues, but more to just take it in and think about how bad these poor people who suffer this for real deal with it on a minute by minute basis. Your brain reacts in different ways, and I did have a few moments where the voices would cause an actual reaction from me, with me physically looking behind myself when being told to do so, or feeling fear when the voices spoke about it. It also helps the connection you have with Senua too, feeling for her at all times, even one point of the game finding myself with a lump in my throat. Something I never expected to happen at all. It's not just your ears that get the treatment either, with a section later in the game using the rumble feature on the pad along with sound to make your way through a dark area, a moment which was perhaps one of my most frightening and enjoyable moments in the whole game. The sound of wind and a running river were the only guides you could use to make your way through an area filled with darkness, with only a distant light and immediate surroundings of Senua visible to see on your screen. The game itself is quite a mixed bag when it comes what to expect while playing it. I would personally say it's more a puzzler than anything else, with it also seeing short combat battles that ramp up in how many enemies you see the closer you get to the end. Once you've explored a little at the start, the game opens up with you needing to make your way through two doors, with these doors being about illusion or Fire, with both having a boss battle at the end of them. The illusion door sees you having to manipulate your viewpoint and finding letters/symbols that are found on main doors in that area, with this being the main puzzle seen throughout the whole game infact, or at least the most used one. Using the focus button on your controller (RT) you must find these letters in the area surrounding you and maneuver yourself until these letters/symbols match up when zooming in. Find them and it unlocks the big door that had them on it and lets you move on to the next area. Fire is exactly that, working through fire to run and escape through doors while also solving puzzles like the ones mentioned above. After this, the game opens up once more and you do more of the same without the door having a fancy name, with just a load of puzzles to look forward to and story to be told. Now onto combat, and this is where the game quality takes a little bit of a dip in all honesty. I can't say I was a huge fan of the combat system when playing the game, actually dreading seeing Senua get out her sword ready for combat, knowing a death might be around the corner. The game mentions permadeath very early on too, which would see a save wipe if you let the rot get to Senua's brain that you see on her left arm. There is something I could say about this, but that would spoil something for you, so will leave that for you guys to work out. The combat feels somewhat similar to Dark Souls, by which I mean very basic but giving the player enough things to defend themselves with when it comes to battle. The real issue was when multiple enemies would fill the screen, with the game lacking any sort of lock-on feature, the only clue to an incoming attack from behind being an audio cue from the voices. Start throwing together three or four enemies at once on and off screen trying to get at you, and you just find yourself spamming the evade button while trying to get your attacks in, with things like parry and combat focus never really being explained, or at least not that stuck in my mind anyway. I actually found out about combat focus when pressing RT by mistake in one battle, something that made a hard battle a hell of a lot easier at the time. So yeah, combat will see many have mixed feelings about it. On top of the enemies being somewhat limited too, this can also make it just a dull experience once you've faced most enemy types. The game also has a photo mode with filters and things to mess about with, making it something you will certainly find yourself trying out when playing. Most images in this review were taken using this mode so you can see for yourself how gorgeous the game can be at times. That said, I have also seen a few glitches in the game too, with doors being closed that I opened and am still able to walk right through. Being able to see through walls when getting close to it, and also sometimes Semua's neck or fur around her looking weird. It does take a little away from the game when you view her from the front and see her have a giraffe neck, but this is me being me very picky but needing to mention it. 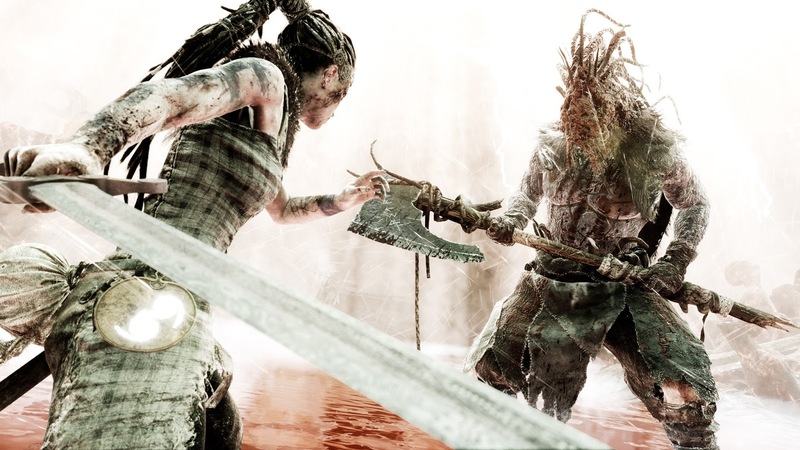 Overall: Hellblade is an experience I'm glad I got to take part in. While not being the best experience so far this year, I would go as far as saying it ranks up there with being a favorite of mine. This game won't be for everybody as the combat is somewhat repetitive, and puzzles can feel that same way too. Best taken on in chunks rather than one whole session would be my tip. No matter what though, you have to tip your internet hat to Ninja Theory for taking on such a subject and doing so well with it. It certainly made me read up a little about things after playing it. Also, as part of the launch of the game Ninja Theory plan to donate $25K to Mental Health America if they reach 50,000 week one unit sales by April 18th, with them going one better if hitting 100,000 sales where they will donate $50K. You get a game that would score 7/10 if I were to go back to using numbers, and a great charity gets some money donated to it via you buying the game. What's there not to like about that? I am loving the game so far man. Definitely best played with headphones on. Be sure to collect those bloody lore stones. Only reason I'm sitting on 900GS and not the full 1,000. Definitely gonna have to pick this one up, simply for the experience. I was going to get it but, with so many other good games releasing, other games ended up getting bought first. I'd heard a lot about their portrayal of mental health issues, good to hear those work well. I'm a bit gutted that the combat isn't great but as long as it's functional, I'll let them away with it. Good review, Tone! I'll get to play this soon, now it's on GP. Plenty to get through but this is definitely on the list!